Welcome to the latest edition of our monthly roundup of food news and events from across the county. As ever there’s so much going on, from fish suppers and farm feasts, to beer festivals and beach barbecues. Scroll down for Diary Dates. Plus we’re always getting asked about staff for the catering and hospitality industry, so we’ve started a new Staff Wanted section. Do let us know if you find this useful. Finally, we’re now on Facebook and Instagram, as well as Twitter, so please do follow us to be the first to know when we publish a new blog post. One of Cornwall’s most gorgeous events, the Port Eliot Festival, takes place from 27 to 30 July in St Germans. Food is a huge part of the festival, and revellers can expect demos in The Big Kitchen, top notch dining, a wide range of street food, and plenty of bars. Demo-ing chefs and food experts include Nathan Outlaw, Thomasina Miers, Matthew Fort, Russell Norman, Rose Prince and Gizzi Erskine. Check out the full line-up for The Flower and Fodder Stage. 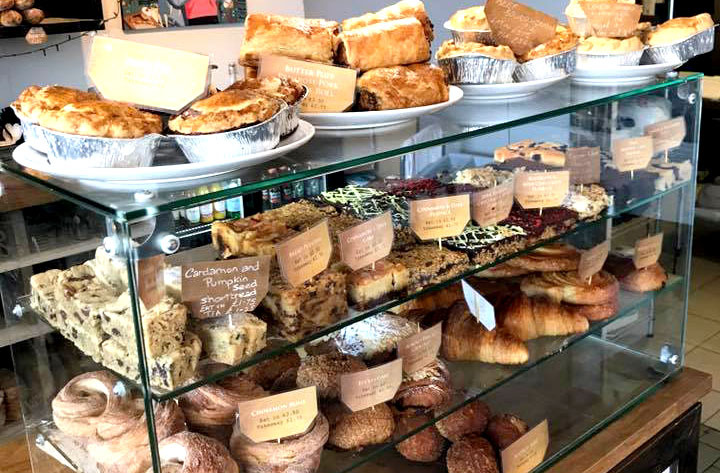 East London’s Violet Bakery will be popping up in the Orangery, serving beautiful breakfasts, quiche and toasties for lunch, and cakes and other baked goods all day. 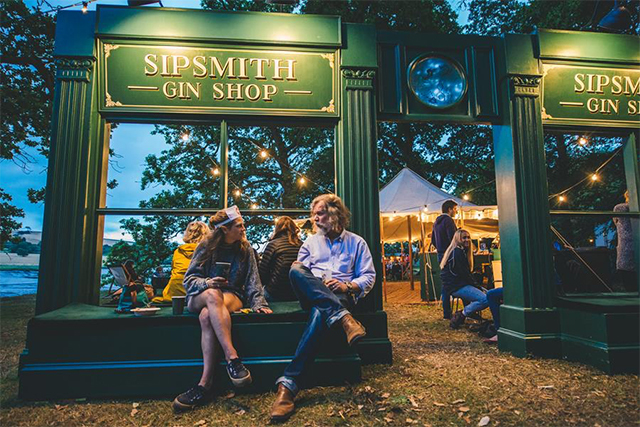 Look out for The Sipsmith Gin Shop, and Mary’s Bloody Ambulance, which will be reviving guests on the campsite with Red Snappers and Bloody Marys. Skinner’s Brewery has bars at The Bowling Green and Caught by the River. 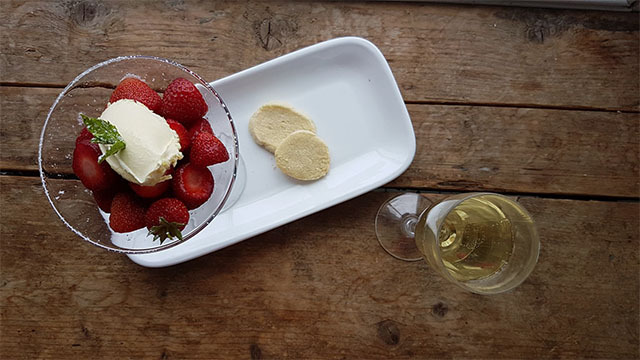 In the Walled Garden, Le Vignoble will be serving wine to match Fal Oyster’s seafood. 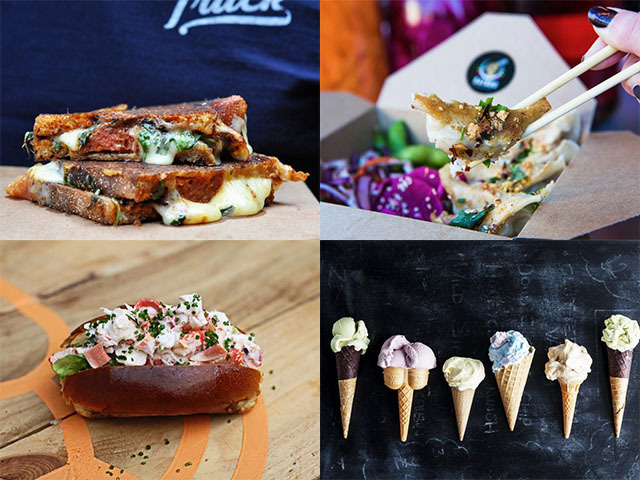 Street food stalls will be dotted around the site, with something to suit every taste, including crab rolls, cheese toasties, noodles, hot dogs, pasta and pizza. For those with a sweet tooth there’ll be crêpes, churros, ice cream, cakes, pastries and candyfloss. For the full line up visit porteliotfestival.com. 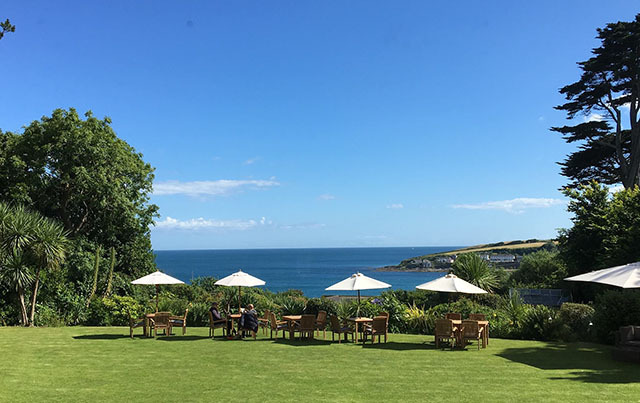 Nancarrow’s next summer feast takes place on Wednesday 5 July, and if the weather is as good as it was for Midsummer (pictured above) guests may be eating supper in the beautiful courtyard. The evening kicks off with an aperitif and Korean fried chicken in the courtyard. Once seated, diners will enjoy skewered and smoked day boat fish, with burnt lemons, roasted peppers, oregano, sourdough and parmesan crumb. The main course sounds delicious: rib of Nancarrow beef, sliced and served with a tomato and ash herb salsa, beef fat, potato, watercress and horseradish salad, dwarf beans, courgette and fennel salad. For dessert, there are donut peaches, infused with fresh thyme, topped with amaretti biscuits and served with vanilla ice cream. And finally, strawberries and chocolate. £35 per person, tickets available online. 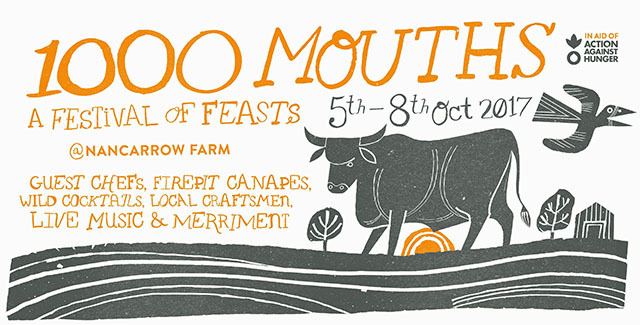 If the above menu tickles your taste buds, then save the date for 1,000 Mouths, Nancarrow’s “Festival of Feasts”, running for four evenings from 5 to 8 October. 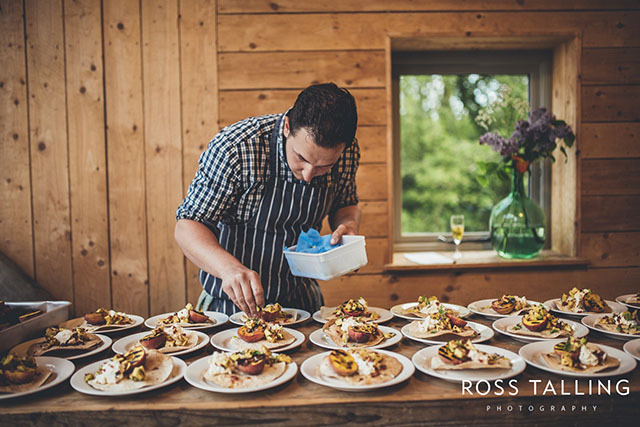 Some of the UK’s most inspirational chefs, producers and foragers will be joining Darren, Jack and the Nancarrow team, to put on an incredible event. 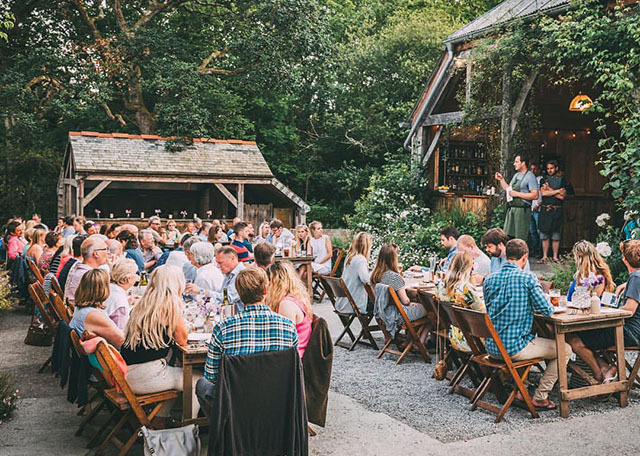 Over the four nights, the team of chefs will feed 1,000 people with the farm’s finest Red Devon beef, and guests will also be able to explore the farm, meet local craftsmen, sample campfire canapés and wild cocktails, and enjoy live music. The event will raise funds for Action Against Hunger and tickets will be available to purchase online from 5 July. A special black-tie ball to celebrate Padstow Christmas Festival’s tenth anniversary will be held in a marquee in the grounds of Prideaux Place on 16 September. 300 guests will be treated to a delicious three-course dinner with live music from Bristol-based ten-piece band, On The Edge. Tickets are priced at £70 each (on tables of ten) and are available from Tina Evans by emailing [email protected]. Any profits will be used to support the running of the festival, keeping it free for everyone to attend. Sitting in The Rosevine’s garden, with its spectacular view, would make anyone happy. Over the next few months the hotel will be running a Happy (two) Hour(s) from 4pm to 6pm, when they will be serving exclusive cocktails, ice cold beers and a large wine selection. What a lovely way to round off a day on the beach, or to warm up for dinner. During Happy Hour, guests can enjoy two cocktails for £10. Check out the recipe for The Rosevine’s favourite cocktail, the Bramble, on their website. The hotel is open to everyone; non-residents are very welcome. For more information visit rosevine.co.uk or phone 01872 580206. 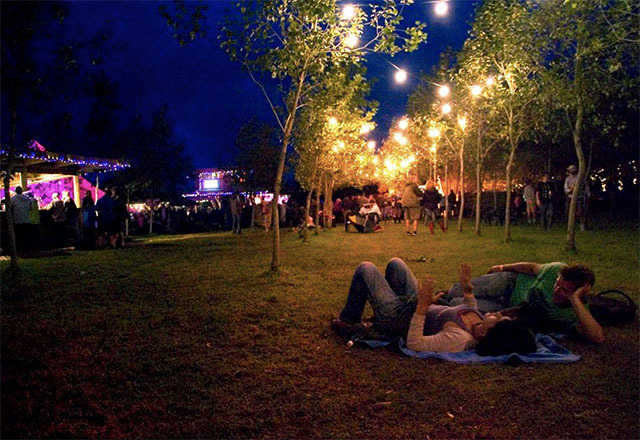 This year’s Leopallooza Festival will be held from 28 to 30 July, at their magical woodland site near Week St Mary (near Bude). Headline acts The Cribs, Gabrille Aplin and Maximo Park top an exciting lineup of more than a hundred new and established bands, DJs and solo artists, over three days and nights. 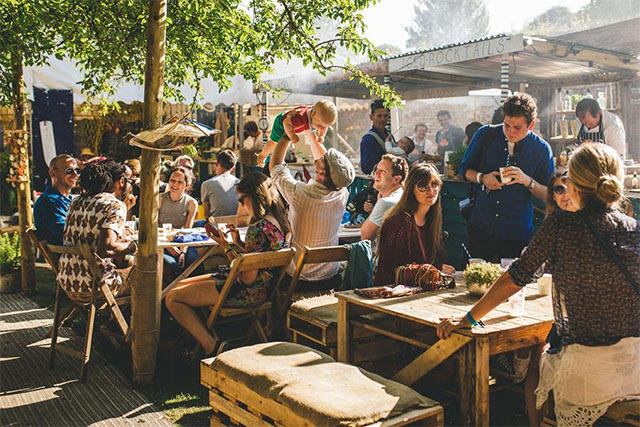 Food and drink is refreshingly reasonable at Leopallooza, with promises of pub-priced pints from Sharp’s Brewery. There’ll be a wide range of food available, with street food stalls including Just Pigs, Burrito Boys, Rebel Town Pizza, The Little Fish Hut, Flavours of Africa, Donut Dollies, The Steamphunk cafe and Wildflower Juice. The Golden Hollow is the VIP area, only accessible for those with a “golden squirrel” ticket, and includes a cocktail bar, luxury loos and showers (yay!) and exclusive, impromptu backstage performances. Tickets are available online, with camping and parking included, priced as follows for the whole weekend: adults £110 (or £180 for golden squirrels), students £95, 6-11 year olds £20, under 5s are free. Family tickets (2 adults, 2 children) £230 (or £390 for golden squirrels). The Alverton’s garden is a haven of tranquility in Truro’s city centre. The hotel’s Sunday roasts are particularly good, with two courses for £16, and three for £20. From Monday to Friday the hotel’s brasserie is offering a free dessert with every main course purchased. Available between midday and 3pm. View the full menu. For reservations phone 01872 276633 or email [email protected]. Da Bara is now serving their own home-reared, bread-fed saddleback pork, ham and bacon. Pop into the Da Bara Café at Ruan High Lanes for the chance to try the pork yourself: in a sandwich stuffed with applewood smoked pork, sauerkraut, Swiss cheese and pickled chillies, pulled pork-topped dirty fries, or a bacon buttie. The café opens until 9pm every Wednesday, with hot food specials each week. Bikes are welcome; the café is right on the roadside on the main drag to St Mawes. 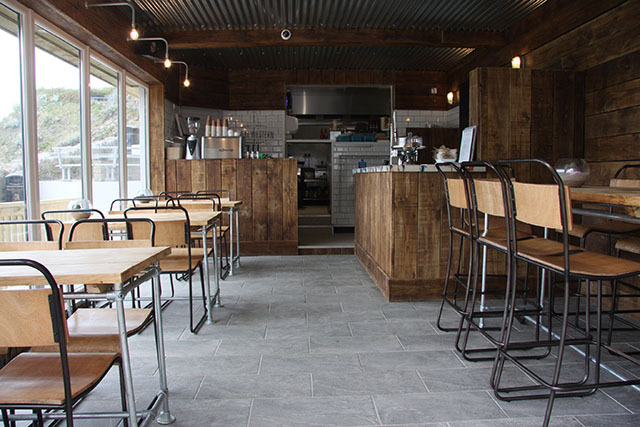 Woodfired Canteen has a summer residency at West Beach, at Porthmeor Beach in St Ives. 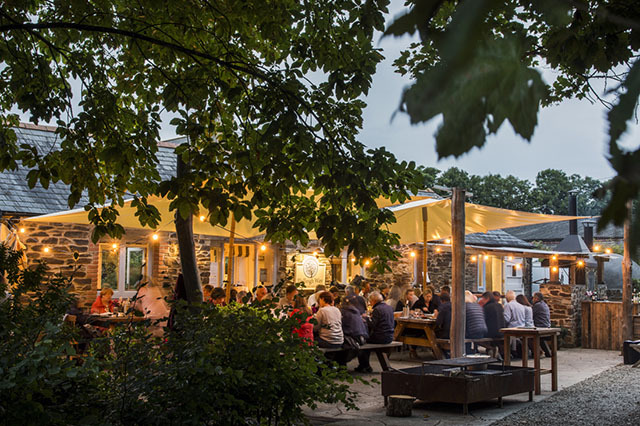 At Woodfired at West the team serves up wood-fired food from the drumbecues overlooking the beach, with sittings at 6pm and 8pm each Tuesday and Thursday throughout the summer. 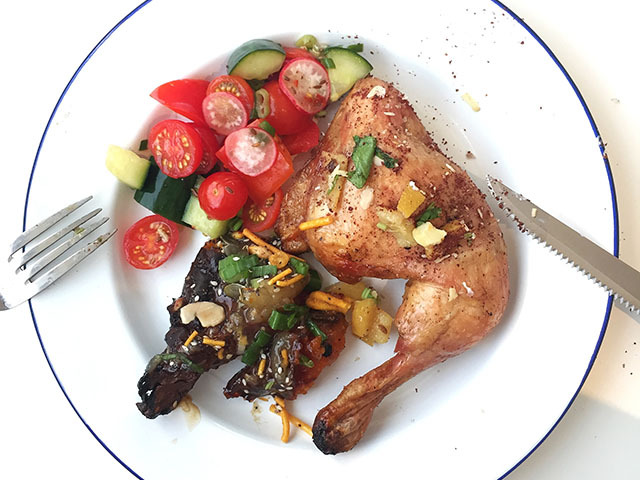 We recently enjoyed an evening at West, tucking into delicious spiced chicken (pictured). Read more here. Tickets are priced at £25 per person for nibbles and three courses, with vegetarian options available, and can be purchased online in advance. You can also turn up on the day and hope that they can fit you in. Drinks are available to buy from the bar. 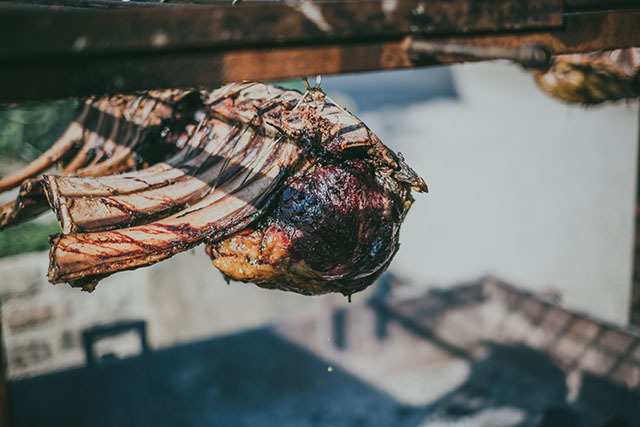 The Ship Inn in Wadebridge hosts its first Green Egg Sunday BBQ on 16 July, offering slow cooked hogget shoulder, bavette steak, sweet potato and halloumi, all served with a selection of salads. 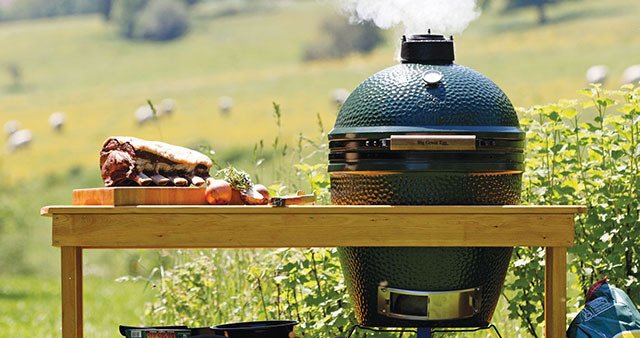 Kernow Fires is lending the pub their Big Green Egg for the weekly summer BBQ. In addition to the food, which will be served between 5pm and 8pm, there will a DJ playing relaxed music, and special drinks for the evening. The Ship Inn is celebrating being one of the last six finalists in the Best Wine Pub of the Great British Pub Awards 2017. The judges were particularly impressed by activities such as the monthly Wine Club (first Tuesday of the month) hosted by Mission Wines’ Tamsin Jones, special and interesting “Wines of the Moment” and a new wine list. The finals will be held in September. At its new location on the Camel Trail side of the estuary, the Rock Oyster Festival will be held on 7 and 8 July. It’s a great event, with good music and entertainment for all the family. This year will again have the wonderful FSL Food Academy, with talks and demos on the Saturday afternoon, including Jane from The HedgeCombers​, Tim Marshall from Rock Shellfish talking oysters, and Simon Lamont demonstrating how to cook them. Stuart Pate (The Seafood Restaurant) will be making something chocolatey and Rory from Tarquin’s Gin will close the show with a cocktail demo. 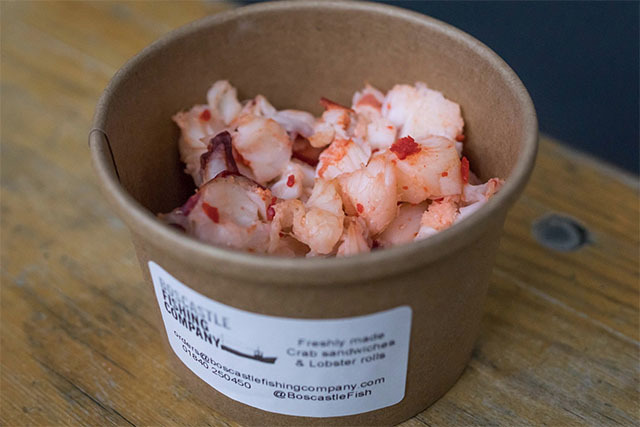 There’s a wide selection of street food including Alice in Burgerland, Woody’s Pizza, Wild Food Kitchen, The Shellfish Pig and Truly Crumptious, plus St Ives Cider and Padstow Brewing. Tickets are available online, adults £38, teens £24, under 12s free. Katy Davidson, The Oyster Lady, will be joining binTwo at The Arc, Hawksfield for a lazy afternoon of oysters and wine from 2pm on Sunday 16 July. Katy has converted thousands of oyster doubters at festivals and events around the world and is a leading expert in her field. She is currently working on her first recipe book dedicated solely to oysters. 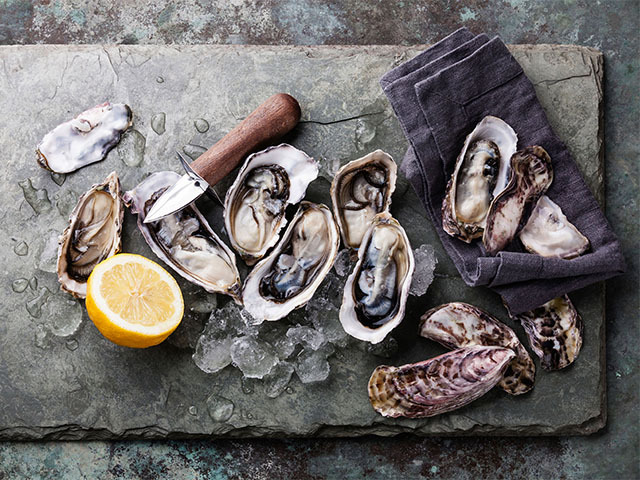 Between 2pm and 4pm, Katy will be teaching guests to shuck through a “hands on” masterclass, and passing on her top tips for maximising the pleasure of eating them, in both their classic fresh state during the masterclass and cooked on the BBQ afterwards. The binTwo team will be picking out some suitable wines to match, and guests will be taught how to make Katy’s favourite ‘Shipwrecked Mary’ cocktail. The Arc will be closed to the public throughout the masterclass but will reopen again at 4pm, when there’ll be an oyster BBQ (open to all) with The Arc serving wines by the glass. Masterclass tickets are £60pp (book online) which includes a wine tasting flight, half a dozen oysters, Shipwrecked Mary cocktail, and shucking knife. 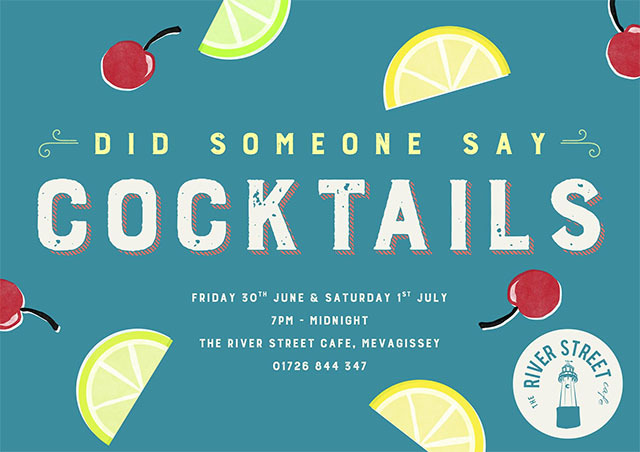 River Street Café in Mevagissey is having a cocktail night on Saturday 1 July from 7pm until midnight to celebrate their 18th year of trading. With rumours of a pizza oven it also marks the finale of Mevagissey’s Feast Week, and there will be fireworks on the harbour on Saturday evening. Pentillie Castle‘s annual BBQ and food festival, Pengrillie, will be held on 6 August, and it’s not too late for teams to enter the BBQ competition. 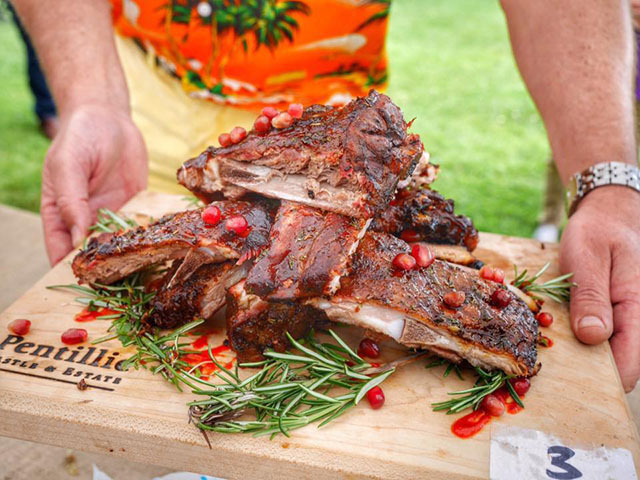 Twelve teams will be going head to head to win the title of Pentillie Pitmaster, cooking their way through the four categories: ribs, burgers, fish and chicken. With local suppliers and food stalls, this is a fun family day out for all BBQ enthusiasts, both eaters and grillers. Surrounding the competition will be BBQ demonstrations, a chilli eating contest, Skinner’s Brewery bar, street food outlets, and live music. For more information, see Facebook, phone 01579 350044 or email [email protected]. The Boscastle Fishing Company‘s boat, Beeny, brings in a daily catch of lobster and crab to their harbourside shop in The Rocket Store. Here, customers can buy live and cooked whole crab and lobster, as well as delicious crab sandwiches, Maine lobster rolls and dressed crab. They will also be offering a lobster and crab delivery service within a five mile radius of Boscastle. Catering and wholesale enquiries welcome. Email [email protected] or phone 01840 250450. 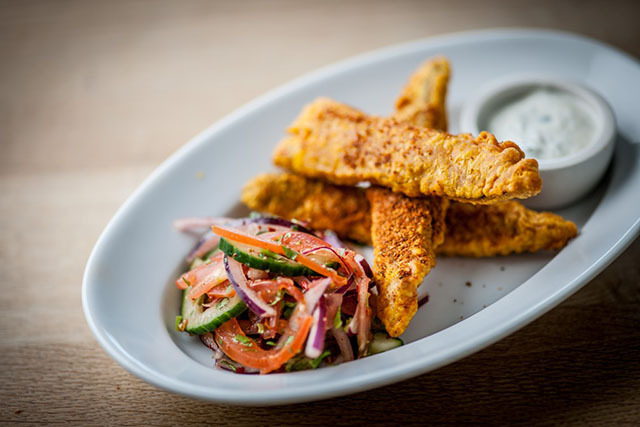 On Thursday 13 July, watch the chefs at Rick Stein’s Cookery School demonstrate three Asian dishes – including one of Rick’s personal favourites, Amritsari fish (pictured above) alongside Mie Goreng and Balinese slow-cooked pork. The evening costs £35 per person, and includes a taster of each dish and a glass of wine. For full details visit website. 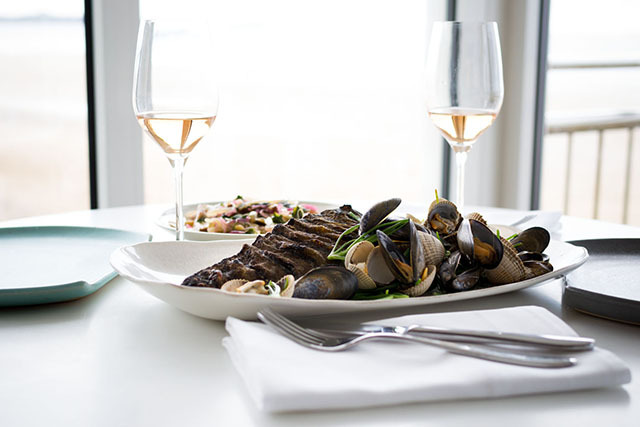 Just in time for the arrival of summer, Rick Stein Fish in Falmouth is now taking table bookings for dinner. They’ll also be saving some seats for walk-ins, so everyone gets a chance to enjoy firm favourites, like their gloriously messy Singapore Chilli crab, Indonesian seafood curry or classic cod and chips. Craftworks street food truck has a new home for the summer. Hidden Craftworks is set up at Padstow Kitchen Garden, with a marquee for dining and beautiful views over the Camel Estuary. Reservations can be made by phoning 07920 107699; walk ins and takeaways also possible. Soft drinks are available to buy, BYO beer or wine. Opening hours are 2pm to 8.30pm Wednesday to Saturday, and 12pm to 6pm on Sundays. Padstow Kitchen Garden‘s Ross Geach is running a veg gardening course on 20 July, with a few spaces still available. Visit website for more details and to book a place. £65pp. The Point at Polzeath is hosting the annual Polzeath Beer Festival on 28 and 29 July. Over the past four years the festival has raised over £10,000 for charity and served over 12,000 pints of beer. Live music starts the event at 5pm on the Friday, and continues from midday to midnight on the Saturday. This is a family-friendly event, with something for everyone. Keep an eye on their website for updates. Over the past year Emily Scott has lovingly restored the derelict barn adjacent to St Tudy Inn so guests can now stay the night at the gorgeous pub. 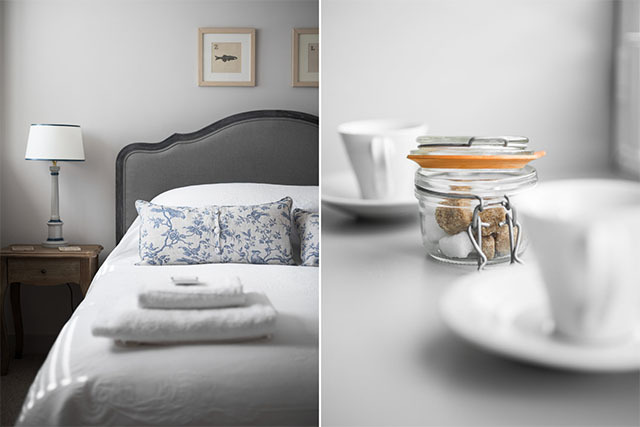 The beautiful rooms have king size beds, and lovely ensuite showers. Room rates start at £135 for bed and breakfast (minimum two night stay at weekends) and £195 for dinner, bed and breakfast (not including drinks). For reservations, phone 01208 850656. 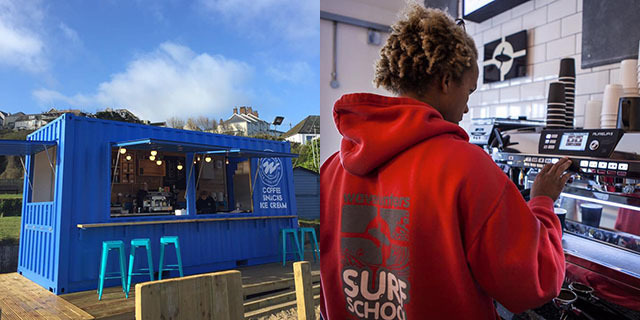 Wavehunters is known to most people as one of Polzeath’s oldest surf schools, but foodies should check out their shop/café in Padstow and pop-up café on the beach at Polzeath. Recommended for great, smooth coffee (they use Olfactory‘s beans, roasted in Penryn), or a post-surf cheese toastie. Fishlock Wines is predicting a rosé summer, and is well stocked with Ed Fishlock’s favourite Côtes de Provence pinks. 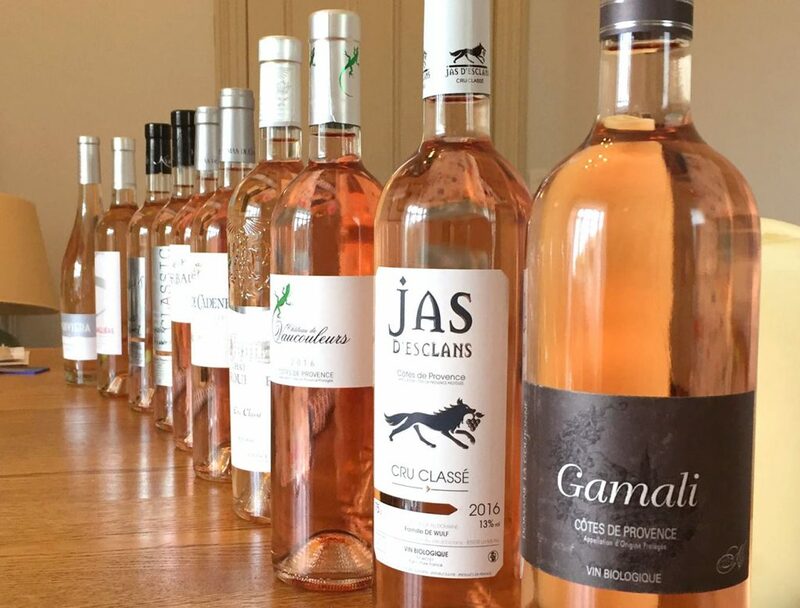 The Wadebridge-based wine merchant specialises in sourcing wine from small, independent vineyards, with an extensive range of French wine in particular. If you need help choosing wine, or fancy trying something new, we recommend getting in touch with Ed, who is extremely knowledgeable. For more information visit fishlockwines.co.uk. Congratulations to Paul Harwood and team, who have just celebrated the third birthday of their restaurant The Fish House, Fistral. 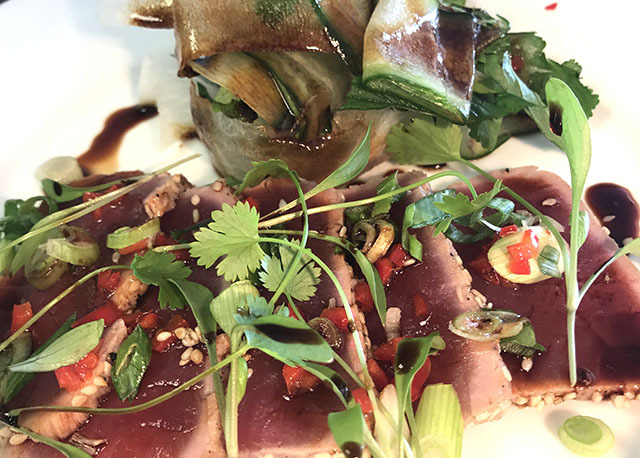 This month’s special is very special: Grade A yellow fin tuna. Don’t miss it! Fifteen Cornwall has introduced a new sharing option to their evening menu, in addition to their à la carte and tasting menus. The five course sharing menu starts with a selection of small plates, moving onto insalata and primi courses, before the main course, which may include large cuts of meat, or whole fish, and dessert. The sharing menu is £75 per person, including coffee, with an optional wine flight for an additional £50 per person. For a more informal evening, you can book a seat at the bar to sample a selection of antipasti and delicious seasonal cocktails. To make a reservation, call 01637 861000 or book online at fifteencornwall.co.uk. For one night only, on 7 July, Philleigh Way Cookery School is putting an Indian spin on one of their Woodfired Sessions. Ben and Jasmine from the Maha Masala Spice Company will be cooking a range of authentic spiced Indian food over fire, taking inspiration from the ancient tandoor tradition. The menu looks fantastic. For full details and to book a place (£35pp) visit website. 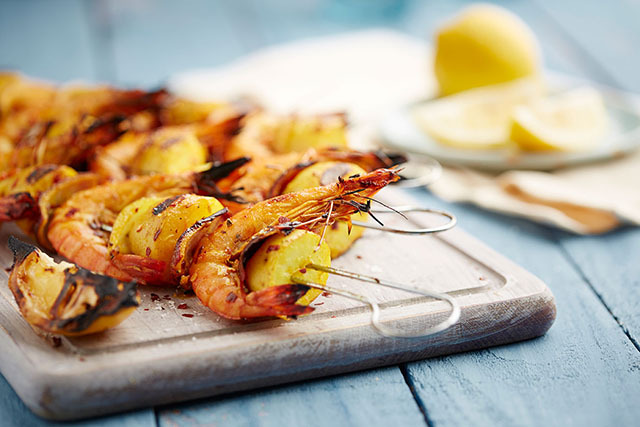 On 12 July the Weber Seafood Barbecue Course looks interesting, where students will learn how to grill, bake and smoke fish and seafood on the barbecue, as well as essential fish preparation. Sample dishes covered include fish tacos, smoked garlic butter mussels, seared tuna, and curried king prawn and potato kebabs. £99 per person. Also in July, there’s a dessert course on 26th, £150 per person, 10am to 4pm. Students will learn a variety of techniques including foams, gels and chocolate work, as well as mastering traditional skills including how to prepare the perfect pastry. The Slope Beach Bar has opened at Great Western in Newquay, run by Lee Gamble, who owns and runs Hotel Sunnyside and No.5 Brewhouse, and longboarder Adam Griffiths, who runs Newquay Surfing School. With an industrial feel to the decor, and sustainable ethos, the new café is a laidback place, with stunning views out to sea. The relaxed menu includes burgers, loaded fries, good coffee and Sharp’s beers. There’s also a wide range of vegan, vegetarian, gluten free and dairy free food. For more details keep an eye on their Facebook page for updates. From 7pm to 9pm on Fridays 7 and 14 July there’ll be acoustic music on the terrace from Pete Hamilton of Slapdash Trio, with pizza and a pint for £12. Finally, the hotel’s second cocktail night will be held on Friday 28 July. Cocktails will be £7 each, with a range of new, classic and modern cocktails on the menu. For up-to-date details on all the above, visit The Godolphin Arms’ Facebook page. With a name like that, it has to be good! Swanpool Beach‘s pop-up restaurant will be open on Friday and Saturday evenings throughout the summer. Guests will be seated at long tables on the restaurant’s beachside deck for either a “seafood extravaganza” or “carnivore’s feast”. For full menu and more details, see Facebook. £25.50 per person. Booking essential. Call 07960 089 995 or email [email protected] to book a table. Garden party with real ales and cider, BBQ, Squashbox Theatre and live music and entertainment at The Old Coastguard in Mousehole. Set your alarms for noon, and be quick if you want to snap up some of the hottest tickets in town. Jeremy Joslin from Bajjer Arts joins the Potluck gang for an evening of art and food at Linden Hay Garden Tea Rooms near Feock. £12.50 without pudding/£15 including pudding. From 6.30pm, an evening of all things coffee. Taste a selection of Origin’s direct-trade coffees from across the world and learn about roasting. £5pp, all proceeds will be donated to ShelterBox. RSVP to [email protected]. Freshly landed sardines hung from a wire and cooked gently over wood-fire. Served with wild samphire, pestle & mortar oregano dressing, roasted vine tomatoes and Rosevine saffron potatoes, £14pp. Slowly roasted, Lebanese spiced chicken, finished over oak flames. Served with an edamame bean, pistachio and pomegranate tabbouleh, white bean dip, pickled Guindilla peppers and Da Bara cumin-infused flat bread, £17.37pp. 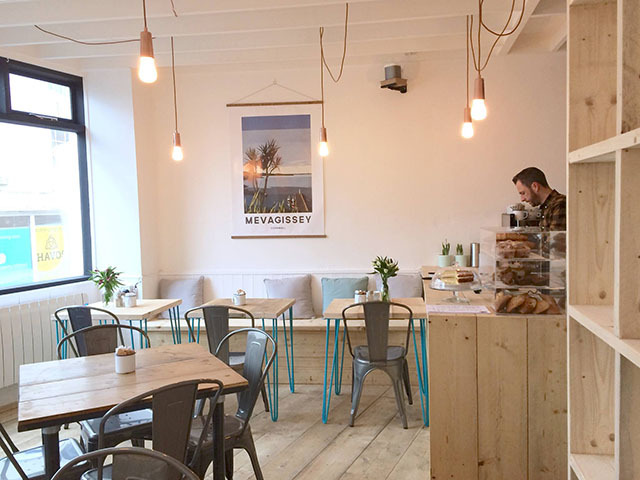 Polzeath’s beachside café opens its new rum bar. 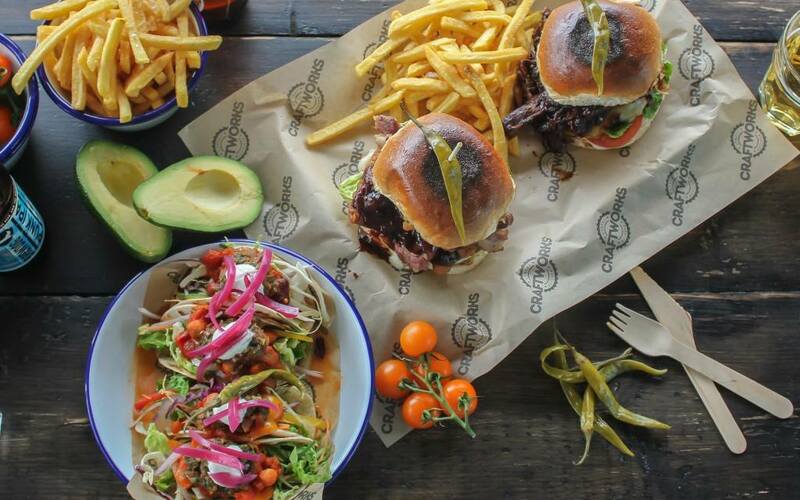 Expect jerk BBQ, live music, and lots of rum. The Hungry Horsebox Co and Gwithian Academy of Surfing are joining forces to offer an early evening surf session followed by a sunset cookout on the beach. £22pp, register online. The Cornwall-based team ventures over the border for a wood-fired Sunday lunch near Tedburn St Mary. £30 adults, £15 children. The first Gurnard’s Head Supper Club outing, with a shared table laden with crab, oysters, mussels, and more. Tickets available from [email protected]uk or call 01736 796928. £35pp. Join Naoko’s Kitchen for a sushi making lesson, eat Pad Thai, and wash it down with a glass of wine. £21pp, at The Art of Wine in Truro. Beef and lamb cooked Argentinian asado style. Served with salads, plus starters, bread and dessert. £30pp. Atlantic Hotel in Newquay host an evening of live classical music on their ocean view terrace. £15pp, including a glass of Champagne and canapés, with optional 3 course dinner afterwards, £25pp. The first feast night for The Croust Hut at King Edward Mine in Camborne, with a delicious looking South African menu, £24.99pp. Chicken breast charred over hot coals served with lemon courgettes, white bean mash, blistered peppers & tahini yoghurt dressing, £14pp. The Old Market’s second vegetarian feast, with a wonderful menu including butternut squash and tahini dip with roasted hazelnuts, watermelon and feta salad, mixed fine bean salad with herbs and crushed seeds, basmati/wild rice with chick peas, barberries and fresh herbs, badargani aubergines and naan bread. £15.26pp. Book early for the popular pop-up at The Strand Café at Trebarwith. See Facebook for more details. 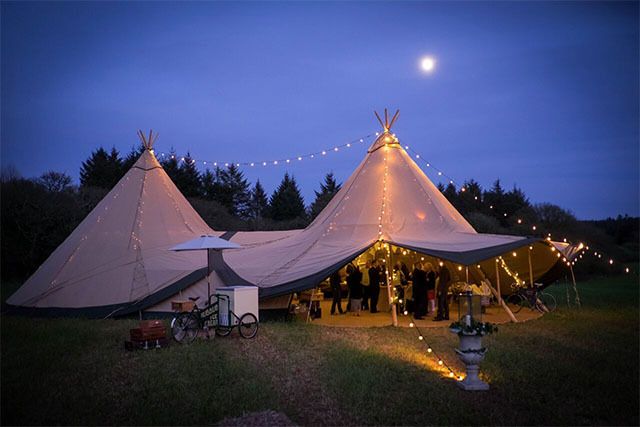 Pop up dinners in tipis in the wild. What’s not to like? £35pp, buy tickets online. Landed straight from the boat onto the beach. Cooked whole and served with a hammer & pick. Hand cut chips, salad and aioli. £16pp. 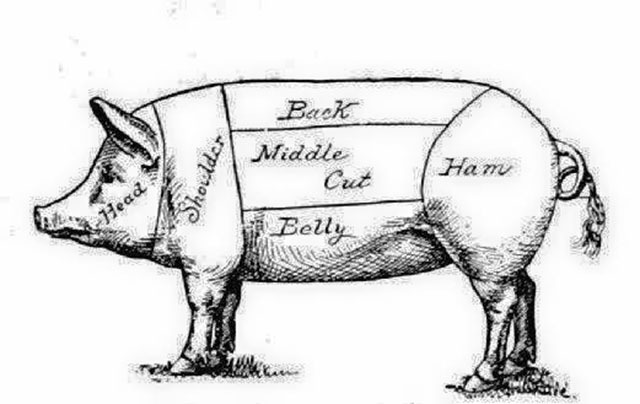 Hog roast from 12pm with live music from Josh Curnow from 4pm. £15pp, or £10 for children including an ice cream. Guests are invited to bring a Spanish dish to share (enough for 6 to 8 people) for a Spanish Potluck Sunday lunch at The Art of Wine in Truro. Wine available to buy, plus jugs of Sangria. Reserve a place and RSVP with the dish you are going to bring here. Three huge pans cooked over wood-fire: fresh local shellfish, monkfish & pollock / chicken & chorizo sausage / mixed seasonal vegetables. £14pp. 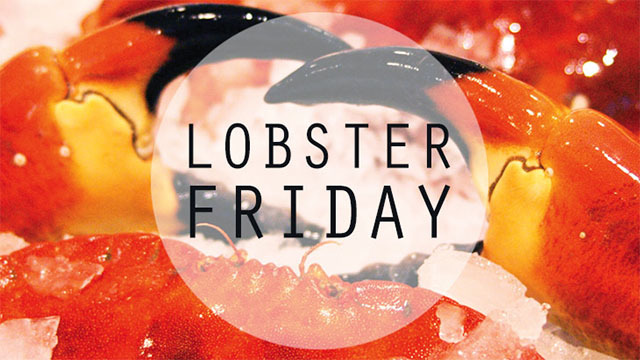 Head down to Watergate Bay for a lobster feast. £50pp or £65pp including wine flight, book online. Save the date for this brilliant festival of Cornish food, on Lemon Quay in Truro. Leopallooza is looking for bar staff to work at their festival from 28 to 30 July. 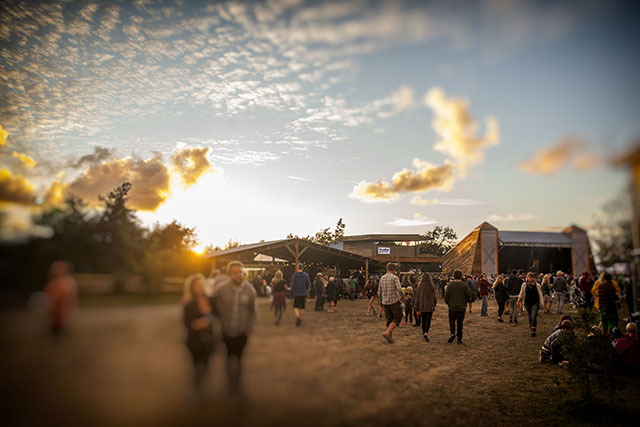 Staff will need to work just eight hours in return for a festival ticket (this can be broken up or worked in one shift), and any hours worked over that will be paid. Please send CVs to [email protected]. Trevose Golf Club is on the lookout for waitresses and one more member for their housekeeping team. See website for contact details. Sam’s is recruiting for their new venture at Cornucopia, as well as at other venues across the county. They are currently looking for managers, assistant managers, chefs, commis chefs, front of house and bar staff. Email [email protected] with your CV. Truro’s Great Cornish Food Store is looking for a senior sous chef – no splits, no evenings, working with great seasonal produce and local producers. Full details online. The store is also looking for a part time commis chef. Front of house staff required at The Ship Inn, Wadebridge. Email Rupert on [email protected] for more information. The Pickwick Inn is looking for a sous chef, accommodation available. Send CVs to [email protected]. The Point at Polzeath needs seasonal and full time bar staff to join the team at The Bear Bar, as well as a part time housekeeper/cleaner. Email [email protected] with your CV and references, full details on website. St Tudy Inn requires experienced front of house staff. Contact Emily via sttudyinn.com. The Scarlet is looking for kitchen, restaurant and bar staff. A full list of vacancies can be found on their website. Watergate Bay Hotel is also looking for staff for their restaurants, bars and kitchens. Visit watergatebay.co.uk for more details. St Kew Inn is looking for full time chefs to join their lovely team. Phone 01208 841259. NB If you apply for a job, please let your potential employer know that you read about it here. The Bear Bar at The Point at Polzeath now has a regular “Cocktail Thursday” with their signature bear themed cocktails priced at £10 for two. Amélies in Porthleven is just about to open a gorgeous new terrace, a lovely spot to enjoy their fantastic food. We like the look of Port Gaverne Hotel’s new Pilchards Beach Bar and Café, due to open mid-July. Trevisker Garden Centre’s new café is due to open this month, date TBC. The kitchen will be headed by Adrian Oliver, formerly of Margot’s in Padstow, hence the name [email protected]. The café will be open for breakfast from 7am and will serve a version of Adrian’s old Margot’s menu until 9pm. Last month we told you about the opening of new St Agnes café, Schooners. By all accounts, it is very good. St Austell Brewery has opened the Havener’s fish and chip takeaway in Fowey. Open from midday until 9pm every day, cod/haddock and chips is £7.50, calamari/scampi and chips £7, children’s portions £4.50. Safu in Newquay is now open, serving sushi and Asian fusion dishes from 12pm until 10.30pm every day. We love to hear from you. Please get in touch via Facebook, Instagram or Twitter, comment below, or send us an email. If you have food news for the August Foodie Diary please email us by 23 July.